Battle Banzai is an improved version of Habbo's old game, Battle Ball. Battle Banzai was released on 21 September 2010 along with a range of furniture to decorate rooms. Battle Banzai still uses the same concept of Battle Ball but with more features. There are also Achievements to be earned from playing Battle Banzai such as achievements for scoring a certain amount of tiles. to add a space hopper to their user, the colour of the gate determines the colour of the hopper a Habbo is on. There are four coloured teams available for Battle Banzai which are; blue, purple, yellow and green. The actual playing field/arena depends on the hosts choice as they set out the playing field/arena themselves from the furniture purchased. The game aims to lock the most tiles on the playing field. When the timer is up, or all of the tiles have been locked, the winning teams' locked tiles flash on and off and the winners from the team wave automatically. Then, the game resets, and all the tiles turn off. To make things fair, there is a limit of five players per team. If a sixth player tries to get through the team's changing gate, they will not have a space hopper added to their avatar as there are already five players on the team. As soon as one person from that team leaves, another person will be able to join. By playing Battle Banzai, it is possible to get achievements for completing certain things. There are four long-term achievements to complete, and a user can progress through these achievements and get a higher level. None of the achievements for this game require any special efforts, simply play the game and eventually you will reach the top level. Many users opt to use a booster which will rapidly increase their scores and earn achievements much faster. We have a page dedicated to the Battle Banzai Achievements here. 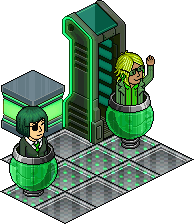 Banzai Rares was a small set of Rares released in the Catalogue during April 2013 as part of a small event centered around the Habbo game "Battle Banzai." Codes were first discovered hinting of these rares on the 17th April 2013, alas it wasn't known what the complete set would look like until a few days later when a Banzai-themed room building competition was released. Disappointingly for some, all of the Banzai Rares turned out to be re-colours of traditional Banzai furniture. All of the rares were released at a price of 25 Credits and they have all subsequently decreased in value. The Rare Banzai Robo was the first installment of the Banzai Rares campaign that ran in mid-April 2013. This was a recoloured version of the original Banzai Robo released in the Battle Banzai category in the Catalogue. It was similar in almost every other way, but this one was a rare hence the rare modification of its name. Similarly to the Palooza and Pirate Rares, the Rare Banzai Robo was released for 25 Credits. It was available for a few hours before it was removed permanently ready for the next Banzai Rare. The main factor why Battle Banzai was revamped was to introduce new Wired Furni that was released on the same day as the Robo. It was also in anticipation of the new Limited Edition Rare the Rare Arcade Cabinet. The Rare Bear Head was the second installment of the Banzai Rares campaign that ran in mid-April 2013. This was a recoloured version of the original Bear Head which was released in the Battle Banzai category in the Catalogue and is blue. The Rare Bear Head was similar to the original in most ways; the name was altered however to reflect that it was a Rare. Similar to other campaign rares like Pirate Rares, the Rare Bear Head cost 25 Credits. It was available for a few hours before it was removed permanently to make way for the next Banzai Rare, which was the [Rare Banzai Sphere. The Rare Banzai Sphere was the last installment of the Banzai Rares campaign that ran in mid-April 2013. Similar to other campaign rares like Pirate Rares, the Rare Bear Head cost 25 Credits. It was available for a few hours before it was removed permanently to make way for the next Banzai Rare, which was the Rare Banzai Sphere. The "Battle Ball Player" seems to be mistakenly named as Battle Ball, which is the original version of Battle Banzai. This page was last edited on 27 February 2019, at 04:02.